So, moving on with tips for writing CTRs for the FCEM exam we are getting ourselves into the position of having a topic, a clinical scenario, a search and some evidence to talk about. Fantastic, we have the ingredients for a fabulous FCEM cake. Now if this were a recipe we would all agree that you cannot make a cake simply by chucking the ingredients in one big bowl and mixing them together…that would be stupid and would no doubt taste disgusting. Why then do exam candidates sometimes do this? All academic work needs a structure, a design, a way of putting things together so that they look right, feel right and yes taste right. I find it really surprising to see candidates in all sorts of work (not just FCEM) disregarding the structure set out to them in the instructions. Is this relevant to FCEM? Absolutely, the college has long publicised both the structure for writing a CTR AND the marking scheme….., and what’s REALLY IMPORTANT is that they are essentially the same. This was covered in the EMJ supplement a while back and I would recommend that you review that article as well. The marking process essentially takes place in three stages as shown in the diagram below. Firstly the examiners mark the CTRs independently before the day of the exam, they submit these marks independently. Secondly, they come together to discuss any discrepancies on the day of the exam and to discuss how and what they are going to ask in the viva. Finally they conduct the viva, mark independently at the end and then discuss to agree a mark. 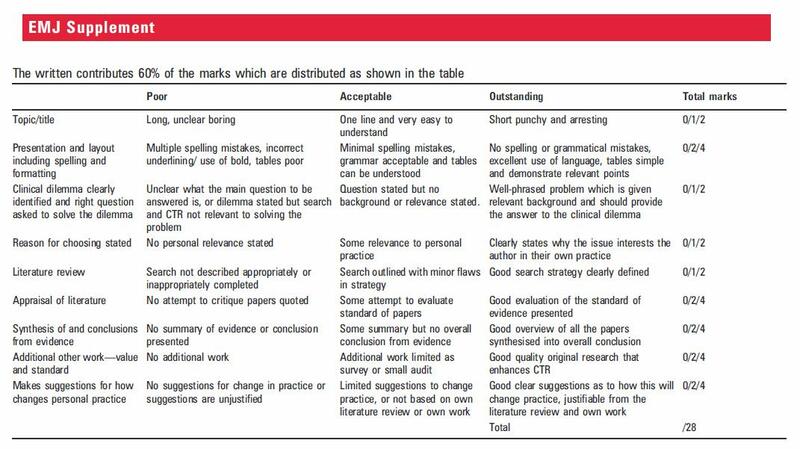 As for the marking scheme then it’s pretty clear what you need to do as it’s very explicit and widely available. The marking schemes for the written component is shown below (click on the table to make it larger). So, it should be obvious that you MUST write your CTR in the same way as the marking scheme is set out. Use the same headings, in the same sequence and with appropriate amounts of effort related to the number of marks available in each section. To do anything but this will really make it difficult for the examiner to give you marks and you do not want that. Here is a suggested sequence for your CT taken from the CEM website. I would strongly advise you to have a contents page with all of these titles on. Why not? It will make it easy for the examiner and they are really quite important to keep happy as they have the marks. Write the CTR in the same sequence and style as the marking scheme demands. Having done all that you will be ready to submit and to await the dreaded viva, and that is where we will go next in helping you prepare. Previous: Previous post: Burnout in the ED: Too tired to sleep, too wired to weep? I see there’s an update to the College regulations though – score above 21 in the written CTR, and you’re exempt from the viva. An added incentive to get it right from the start? Correct, but not for this diet. Do you think that’s a failure from candidates, or from those helping them prepare? I think it can be either or both. I’ve started running a CTR clinic to help diagnose and recommend solutions for problems. New appointments are usualy an hour, with briefer follow ups or e consultations. Trainers and trainees reading the stemlyns blogs and cem regulations may make my clinics redundant. I would be grateful for some advice re my CTR: should I include conference abstracts or not? My papers are roughly 50% abstracts, 50% papers.